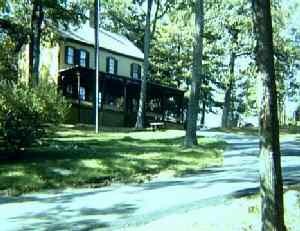 To preserve and interpret the site where Ulysses S. Grant spent the last weeks of his life completing his memoirs. Historic preservation of the cottage allows many visitors today to experience Grant's final days. 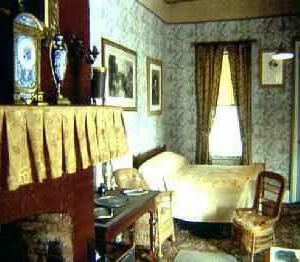 Travel back to 1885 and see the rooms preserved just as Grant left them. There are personal items that belonged to Grant and flower arrangements from the funeral. Open Memorial Day and Labor Day. 10-4 Sat-Sun to Columbus Day. Special prices apply for special events, and group rates are available. Wilton, NY. Exit 16 from I-87 (the Northway). Follow signs. General Ulysses S. Grant and family. Grant Cottage Collection. 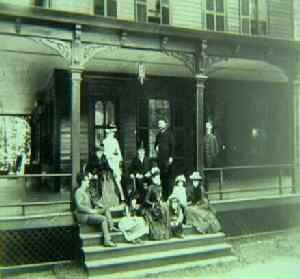 On the steps of Grant cottage. 1885. View of Grant's bed that he died in on July 23rd, 1885. The clock was stopped at the time of his death.